Backup Windows 7. Backup Software for Windows 7 Operating System. Windows 7 Backup requires a different approach than you need for less powerful versions of Microsoft Windows®. It comes with a range of advanced security features which make it relatively difficult to back up system files, disk images, open files, etc. That’s why you need special Windows 7 backup software, such as Handy Backup. Our software proudly carries the “Compatible with Windows 7” logo which verifies that it satisfies all security and reliability requirements when working with Windows 7 and Windows 7-certified hardware. There are one-click presets that facilitate restore of Windows 7 data backup and popular applications. These include System Backup, Documents Backup, Outlook Backup, Disk Image, and a lot more. If you have multiple Windows workstations or servers that you want to back up, you can do it with Server Network edition. It allows backing up all HDDs, SQL databases and other data in an enterprise network. The simplest way to obtainbackup software for Windows 7 is to get a newest Standard edition of Handy Backup. Free 30-days trial version! Windows 7 has an own backup and restore service capable to keep some user files and system data. Sadly, this service has restricted functionality and was replaced completely in newer Windows versions due to a small amount of usability. 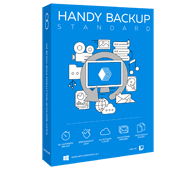 Compared with built-in Windows 7 backup utility, Handy Backup contains advanced options greatly expanding the flexibility and stability. These options, such as extended methods of storing Windows 7 backup to network drive or automating safekeeping of business data, e.g. Exchange and Outlook messages, make Handy Backup a preference over built-in backing up and recovery tool. The performance of Handy Backup as Windows 7 backup software confirms that it correctly exploits all specific options of the operating system and ensures that each component of the program works perfectly under any system configuration (in all modes and on all architectures). Advanced backup settings. The program can perform full, incremental, differential or mixed backup, select file backup types by mask, organize system recovery using an image previously backed up, store entire disk data and so on. Windows 7 registry backup. The software allows you to backup registry Windows 7 file with an entire image of your system or separately. 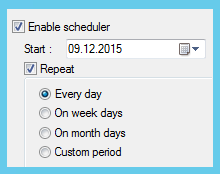 Flexible scheduling. For any backup or restoration task, you can schedule a cycling period from minutes to months. It is also possible to run automatically some external programs before and/or after the particular task. Administering backup tasks. All Windows 7 backup tasks can be scheduled to take place continuously, at a given time, or on certain events (logon, logoff, and other). Advanced users can make use of command line interface, e-mail notification, fast backup and other options. Digital security. All modules, including ZIP compression, Blowfish encryption, Open File backup, and other engines are proven to be stable and error free. Selection of supported storages. 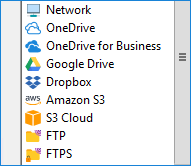 The utility can backup data Windows 7 to any local and external hard drives (including Flash, USB and FireWire drives), FTP/SFTP/FTPS servers, network-attached storage devices (NAS) or clouds both private and commercial. Learn more about supported backup storage types. How to Backup Windows 7 Files or Drives with Handy Backup? To create Windows 7 backup files with Handy Backup, make a new backup task and select appropriate data on the Step 2. For backing up different parts of Windows 7, there are some plug-ins such as “Computer” for files and folders, “Libraries” and “User Folders” for user-specific data, “Registry”, as well as “System Recovery” for drives and partitions. Handy Backup can function not only as Windows 7 backup software but as the utility designed for any modern version of Windows. The list of supported versions includes Windows 10, Windows 8.1, Windows 8, 7, Vista and XP for standalone computers, as well as server editions of Windows Server 2003, 2008, 2008R2, 2012 and 2016. It has also native supporting for Linux-based remote machines in network editions of Handy Backup. Try Handy Backup - the most powerful Windows 7 backup software! And meet the news that Handy Backup supports Windows 8 too. Backup Windows 8 by Handy Backup is also available as I know.